Posted March 20, 2018 & filed under Service. Your forklift works hard. Reward it and keep it working hard for the years ahead. 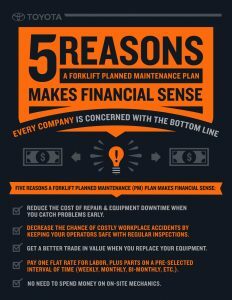 Planned maintenance isn’t just a reward for your forklift, it is a reward for you. Planned maintenance helps alleviate the stress of surprise break-downs, costing you and your business money. It can also help boost your productivity. With Toyota, you can also be rest assured that a technical expert will be servicing your forklift. Toyota has stringent training standards requiring numerous on-line and classroom courses. Training includes planned maintenance (PM) performance, IC and electric motors, mast operations/mechanics, electronic theory/systems, hydraulic concepts, model-specific operations/repair, safety procedures, and advanced diagnostics. The certification curriculum contains over 100 courses representing almost 200 hours of classroom time and another 100 hours of online training. All Allied maintenance/repair personnel have extensive mechanical education/experience before they are hired. They then achieve Toyota Certified Technician status within their first six months on the job and subsequently pursue Master Technician levels. With this level of training and expertise, you have peace of mind that your forklifts will continue to operate safely and with little downtime. For more information about maintenance plans, contact Allied Toyota Lift today.